Diagnosing Ebola: Why isn't there a rapid, reliable test? "Diagnosing Ebola is very different from treating Ebola." That assessment, by Dr. Daniel Varga, chief clinical officer at Texas Health Resources, during testimony before a Congressional panel on Thursday, sums up a critical concern at the heart of the current Ebola scare. 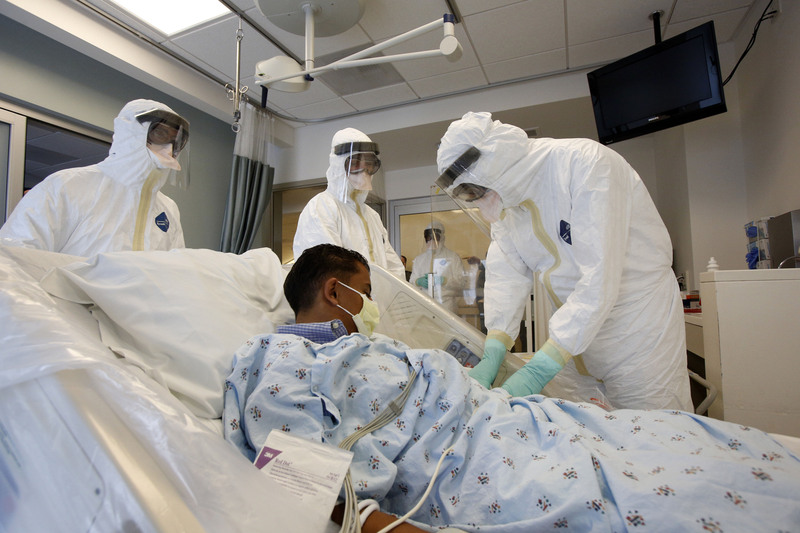 It was the challenge faced by staff at Texas Health Presbyterian Hospital in Dallas as they struggled in late September to identify and manage the case of Thomas Eric Duncan, the first patient ever diagnosed with Ebola on American soil. Duncan, a Liberian national, died of the disease on Oct. 8. The problem: the absence of an accurate, rapid test for Ebola, even in the disease's symptomatic stages. Varga, who oversees Texas Health Presbyterian Hospital, believes the hospital was "well prepared and equipped" to care for a patient diagnosed with Ebola. "Where we fell short initially was in our ability to detect and diagnose" the infection, he testified. Complicating matters is the fact that the initial symptoms of Ebola -- high fever, headache, diarrhea, vomiting -- can seem much like those of other infectious diseases, including influenza. And with another U.S. flu season set to begin, how will worried Americans quickly know if they have that common bug -- or Ebola? A test that can tell the difference in minutes or even a few hours just isn't available right now, experts say. First of all, there is no test at all to determine Ebola infection in a person without symptoms. "Ebola has an incubation period of from two to 21 days, and nothing we have is effective at picking up infection before that happens," explained Philip Tierno, a clinical professor of microbiology and pathology at NYU Langone Medical Center in New York City. "In fact, pre-symptomatic diagnosis is really a holy grail for infectious disease," added Dr. Amesh Adalja, a spokesman for the Infectious Disease Society of America. "It would be great to have it for Ebola and influenza, and a whole host of other infectious diseases, so we could intervene fast. And it's certainly something that many people are researching. But that kind of screening ability is really still in its infancy." But what about after symptoms begin to appear, as in Duncan's case? Again, no speedy test for Ebola yet exists. That means that "it's going to be very difficult to distinguish influenza from Ebola," Adalja said. "Right now," Tierno added, "there's just no simple, fast Ebola test because there's been no demand. Until now, nobody has wanted to spend the money to get a commercially available rapid test out there." He said that "what we do have on hand is the PCR (polymerase chain reaction) test," a DNA analysis that can identify the genetic fingerprints for a host of infectious diseases. This is the type of laboratory test that's been used to diagnose symptomatic Ebola cases so far. The catch: The PCR test typically takes at least 24 hours to bring back results, Tierno noted. That could change due to emerging technology, however. "Much more rapid diagnostic tests for other infectious diseases such as influenza, mono [mononucleosis] or group A strep do exist," Tierno said. "And there is a new technology, made by a company called BioFire, that does do very rapid PCR testing, which for influenza gives results in an hour. It's a real breakthrough. But it will only work with patients who already have symptoms, and it has only gotten FDA approval for respiratory infections -- not for Ebola." Adalja agreed that "the fact that this rapid test works for influenza argues that it would work for Ebola as well. There's no reason it wouldn't." So, is FDA approval for a similar, quick screen for symptomatic Ebola in the offing? "I certainly think the FDA will now have to fast-track it for approval," said Tierno. "But then the big problem becomes who's going to pay for this? It's not going to be cheap -- it's probably $150 a shot. And with the kind of hysteria we have already, anyone with sniffles is going to demand this analysis." In the meantime, factors other than a blood test may be the public's best defense in quickly spotting Ebola, the experts said. "The 'big screen', so to speak, has to be travel history," Adalja said. "Right now Ebola is only present in three countries in West Africa. So if a patient with symptoms has been to this region in the last 21 days, or has had contact with anyone else who has been or has a confirmed case, than Ebola may be higher on the list of concerns." Added Tierno: "Based on that, a patient is flagged for risk [and] then he would be quarantined immediately. Before any testing -- placed in an isolation unit. And then, I would say, first tested for influenza, and then perhaps a panel of 22 or 23 other respiratory organisms as a second step. Only when all else is ruled out should we test for Ebola." Both Tierno and Adalja stressed, however, that in the vast majority of cases, symptoms will not turn out to be due to Ebola. Right now, "the risk that someone [in the United States] who doesn't fit the travel profile will actually contract Ebola is infinitesimally small," said Tierno. "It's basically non-existent." And Adalja said there's one more clue that the lousy way you're feeling is probably flu, not Ebola. "Ebola is primarily not a respiratory disease. So it doesn't necessarily cause a runny nose, or congestion or sneezing," all standard flu symptoms, he said. "Only one-third of people with Ebola will cough, whereas that is much more prevalent with the flu."